Saffron, highly prized as a spice and dye, is derived from the stigma and styles of the saffron crocus, or Crocus sativus. It is a perennial plant that flowers in the fall and is often mistaken for its wild cousin, the common autumn crocus called meadow saffron, sometimes with deadly results. Throughout its history being cultivated for human use, saffron was selectively bred to produce longer stigmas. This breeding has resulted in a sterile plant that cannot reproduce without human assistance. 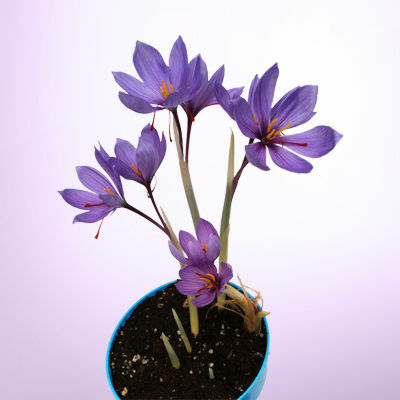 The flowers do not produce seeds; the bulbs of the saffron crocus must be dug up and separated, then transplanted to begin new plants. Each year, the saffron crocus grows from one corm that in turn produces as many as ten "cormlets". It is from these cormlets the new plants sprout after they have been dug up, divided and replanted. The parent corm will die off after one year, leaving the cormlets to carry on the plant. Saffron is comprised of over 150 volatile compounds, along with many nonvolatile active components. The glucoside picrocrocin compound, which is responsible for the flavor of saffron, has insecticidal and pesticidal properties and can account for up to 4% of the volume of dried saffron.